Swiss Chalet menu prices at your fingertips. Swiss Chalet Rotisserie and Grill is the leader at offering rotisserie chicken. Since 1954, Swiss Chalet has used fresh, Grade A Chickens covered with their secret seasoning to keep patrons coming back for more. Partnering rotisserie chicken with mouth-watering ribs, Swiss Chalet has expanded to over 200 stores across Canada. People keep on coming back to get a Quarter Chicken Dinner, which is a roasted chicken leg or breast, a roll and a side dish of your choice. Of course, it comes with the delicious Chalet sauce. Another delight to the menu is their ribs, which are marinated for 24 hours and cooked and basted with their authentic smoky mesquite sauce. The usual favorite would be the Honey Garlic Feature, or a quarter of rotisserie Chicken glazed with our Honey Garlic sauce. Choice of side, coleslaw, a piece of garlic toast and a cup of soup or slice of pie. Side orders vary from fries, baked potato, Yukon Gold mashed potatoes, Caesar salad or coleslaw, among others. There are other favorites such as fish and chips and chicken and shrimp. There are lighter dishes on the menu like the healthier alternative quarter chicken or the spinach chicken salad. The ultimate bacon cheeseburger or the rotisserie chicken club wrap are other options, and a different take on roasted chicken. They even have roasted chicken flatbread and a hot chicken sandwich. Their desserts include generous slices of apple pie, pecan pie or lemon meringue pie. All of which are perfect to and a satisfying meal. 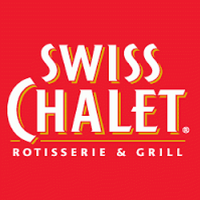 For more information about Swiss Chalet, visit their official website. Baked beans would be nice. Was not impressed with the size of the quarter chicken dinner we ordered from the chalet on Kenaston in Wpg chicken was totally tough. Sent a complaint in they said someone would get back to me now is approx two weeks later , no one has contacted me guess my business is not very important to you.